(Newser) – Rising from the ashes of 9/11, the new World Trade Center tower has punched above the New York skyline to reach its powerfully symbolic height of 1,776 feet and become the tallest building in the country. Or has it? A committee of architects recognized as the arbiters on world building heights is deciding whether a design change affecting the skyscraper's 408-foot needle disqualifies it from being counted. Disqualification would deny the tower the title as the nation's tallest. Is the picture frame a part of the picture? Are the shoe laces part of the shoe? A needle doesn't count, come on, build a real building and don't cheat. 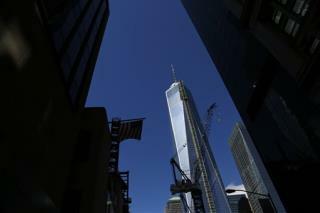 Anyone can build a ten foot building and place a 2000 foot needle on it, but does that make it the tallest building, no! Well, we'll just have a beautiful building 1,368 feet tall commemorating the founding of the Ming Dynasty, that's all. The Chinese should love it. Or a memorial to the year The Worshipful Company of Poulters "received the power to regulate the sale of poultry, swans, pigeons, rabbits and small game." Y'all remember THAT ... surely ... Maybe we could dedicate it to the The National Library of France tracing its origin to the royal library founded at the Louvre Palace by Charles V in 1368. Ahhh ... the exCITEment!!! Think of all the Charles V groupies swarming the lobby!!! orrrr, on a more pious note we could establish a shrine to The Certosa di San Martino, ,a former Carthusian monastery complex, now a museum, in Naples. It was finished and inaugurated under the rule of Queen Joan I in 1368. Think of all the ... Carthusians ... genuflecting in the nave. What an uplifting scene!! (Googledy, Wiki-dy wik wik, Senator Paul ) Why, the possibilities are ... absurd. Look ... just stick something on top of the damned thing that even the "Sears Tower Protection Society" can't deny ... maybe a HUUUUGE flag pole.